The Ultimate Digital DJ Mixer! 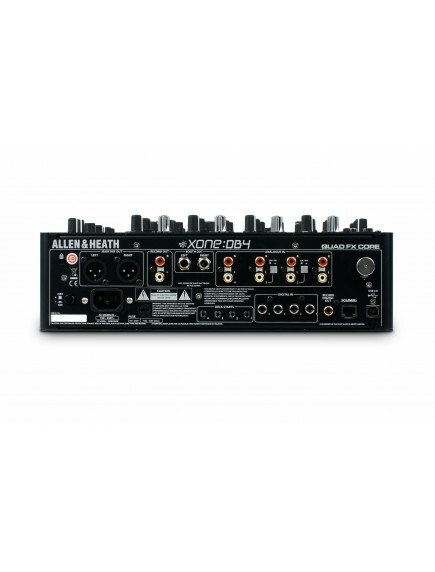 Redefine your DJ rig with an Allen & Heath Xone:DB4 digital DJ mixer! Quite possibly the most advanced 4-channel DJ mixer money can buy, the Allen & Heath Xone:DB4 puts a world of flexible routing, must-have tools, and freakishly powerful effects at your fingertips. Each of the Xone:DB4's channels comes loaded a killer DSP effects engine, 3-mode EQ/filter section, tempo syncing looper, and more. And it gets even better. 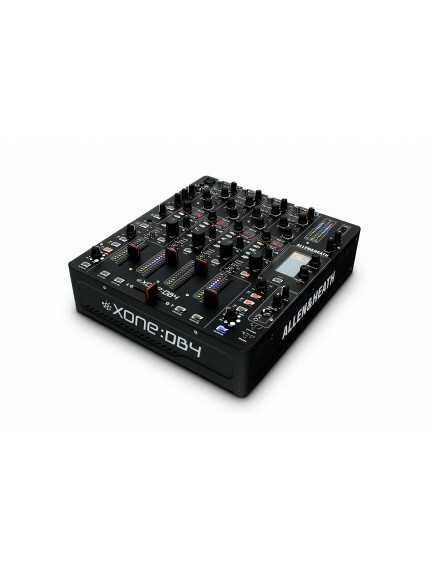 There's also an 16-channel USB 2.0 audio interface and a full-fledged MIDI controller onboard, making it super easy to travel light when you DJ with an Allen & Heath Xone:DB4 mixer. 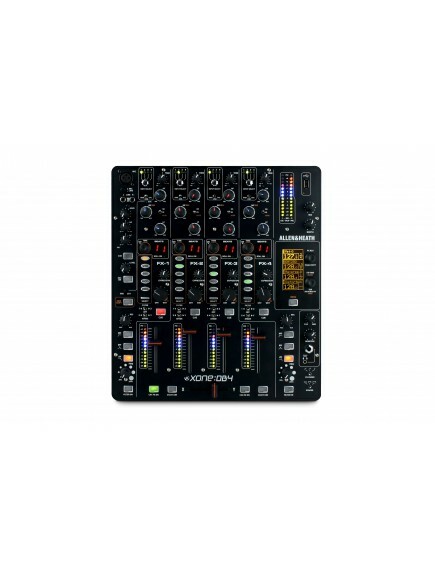 You're just not going to find another digital DJ mixer that brings as much to the table as the Allen & Heath Xone:DB4. That's because Allen & Heath loaded the Xone:DB4 with their powerhouse Quad FX Core DSP engine, giving each of its four main channels a dedicated effects processor. This isn't just any effects processor either, it's the based on Allen & Heath's iLive console effects system, so it sounds amazing! Choose from delays, reverbs, modulators, resonators, and damage effects types for each channel. What's more, a beat-detection engine automatically locks your effects to the tempo. Each channel also gets its own looper. These loopers let you go from full 4-bar loops to 16th notes - perfect for creating massive buildups! Allen & Heath has always been known for their fantastic-sounding EQs and filters, and the Xone:DB4 DJ mixer only adds to that well-deserved reputation. Each of the Xone:DB4's four main channels gives you a 3-band trimodal EQ with standard asymmetric +6/-25dB curves or a 24dB/octave-slope +6dB/OFF isolator on each band. You can also reconfigure each channel's EQ as a highpass/lowpass filter system with adjustable resonance. That's not all! 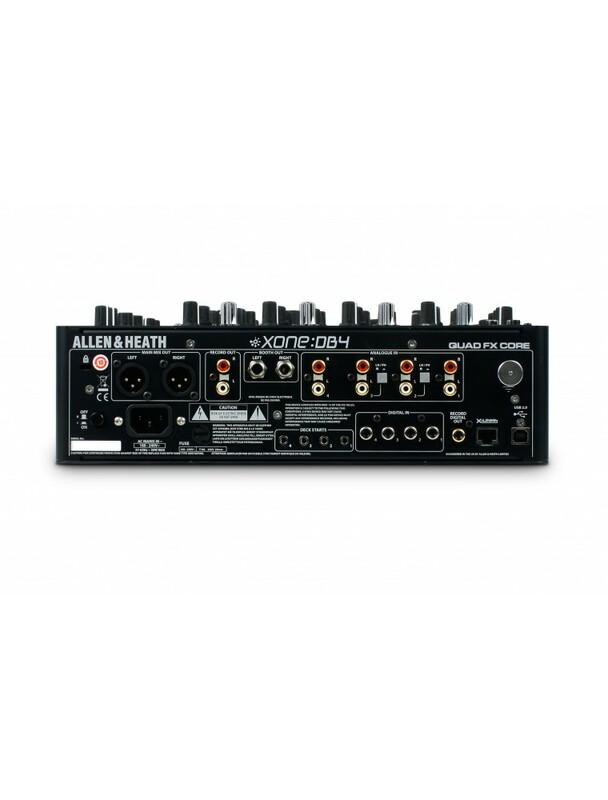 The Xone:DB4 also comes loaded with Allen & Heath's Xone dual filter system, which lets you assign each channel to one of two additional fully adjustable filters. Designed to be the beating heart of the most technologically advanced DJ rigs in the world, the Xone:DB4 comes fully equipped to integrate completely with the DJ software you use. Built into the Xone:DB4 is a fantastic-sounding 24-bit/96kHz USB 2.0 audio interface, which lets you send and receive up to four stereo channels to and from your computer. All controls except for the microphone and headphone volumes on the Xone:DB4 can also send MIDI information to your software, allowing it to play double duty as your MIDI controller. And when you hit the MIDI shift button, the Xone:DB4's loop and FX selection controls send MIDI data without changing your settings.